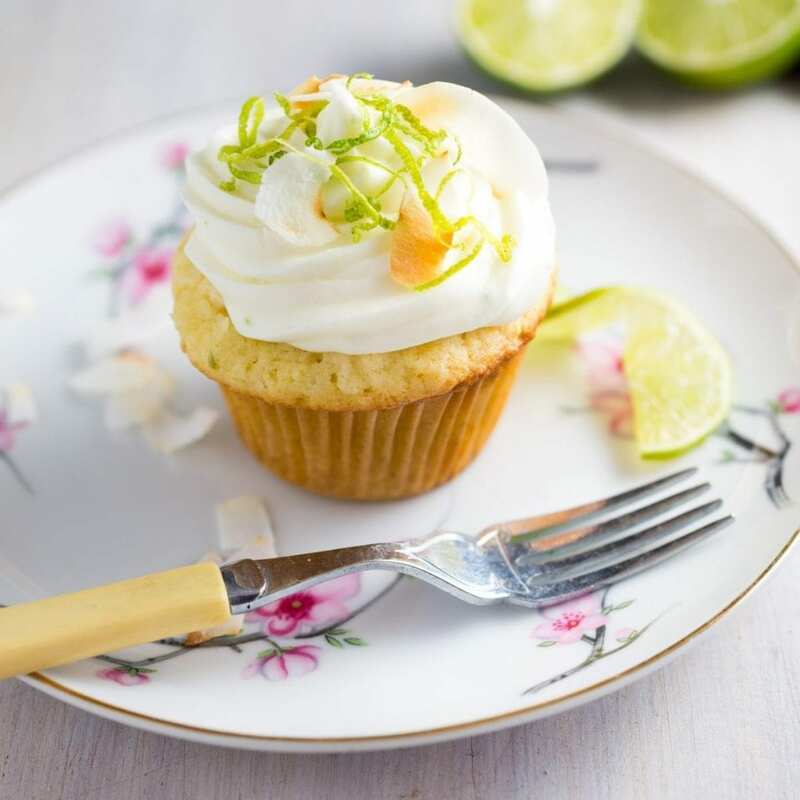 These coconut key lime cupcakes titillate your tastebuds with light, tropical flavors and look pretty dang party, too. Who would have thought that a blog whose scintillating early posts had titles like “My Kettle” and “In Case You’re Wondering If You Can Boil A Pre-Sliced Ham In Coca Cola. Answer; You Can’t,” would make it 3 whole years. We’re as shocked as you are but somehow we’ve managed to keep this sputtering, mildly out-of-control train on the tracks. Yeah, us! But really all thanks go to you, our readers, who we love and adore. If it wasn’t for your positive feedback, I’m sure we would have given up ages ago and would most likely have picked up some other, less respectable hobby. Like knitting. Or taxidermy. 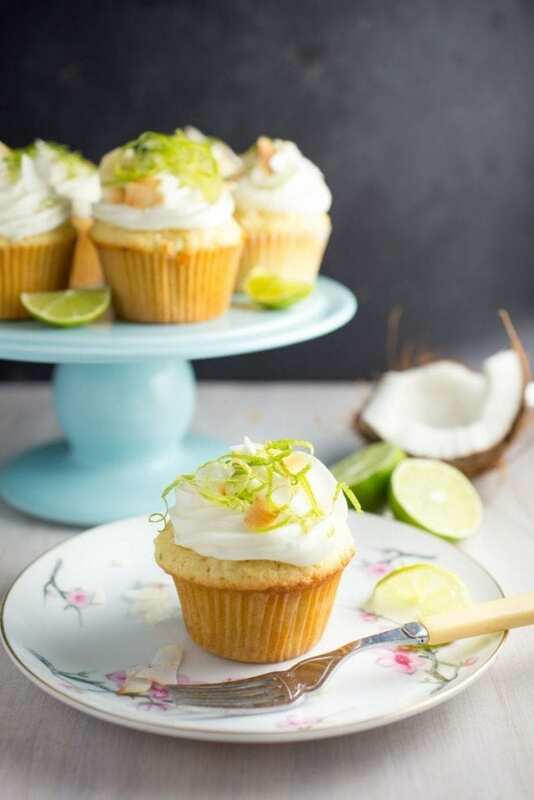 So we decided to celebrate this achievement, not with champagne and caviar like fancy people, but with a boat-load of delicious, tropical coconut key lime cupcakes! Full disclosure: we’re getting together with some friends for a Thai-food potluck and we thought cupcakes would be a great dessert with which to end the night. 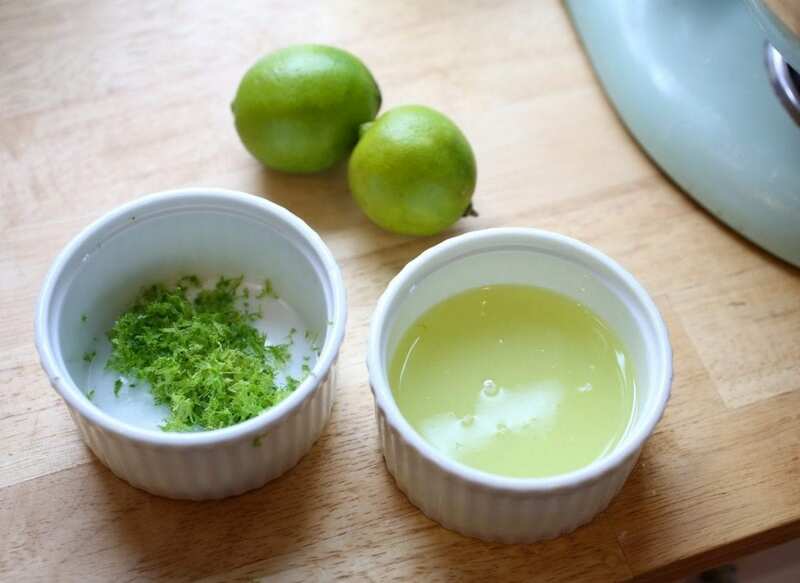 I thought about making a Key Lime Pie, but we already blogged the ultimate, most delicious version and cupcakes are safer for a crowd because no one has to fight over who gets the biggest slice (duh, me). 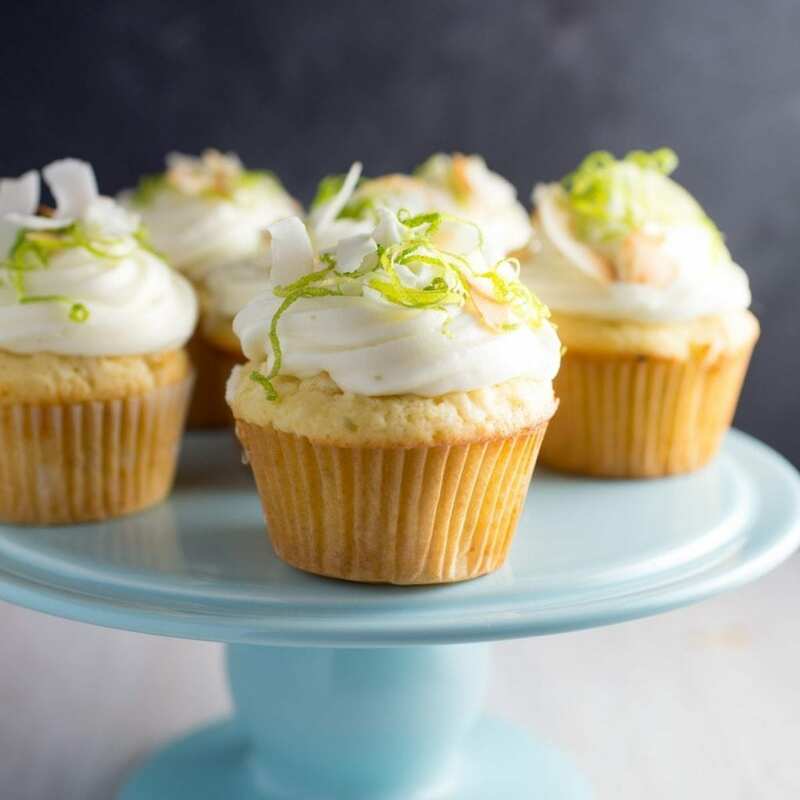 And let me tell you, these are some damn fine coconut key lime cupcakes. 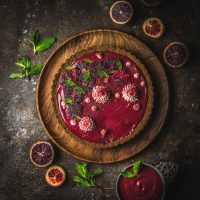 The coconut keeps them very moist and the sweet, tart cream cheese frosting is good enough to eat with a spoon. In the bowl of an electric mixer fitted with the paddle attachment, cream the butter and sugar on high speed until light and fluffy, about 5 minutes. Turn the mixer to low speed and add the eggs, 1 at a time, scraping down the bowl once or twice. Add the vanilla extract, lime zest and juice and mix well. In a separate bowl, sift together the flour, baking powder, baking soda, and salt. 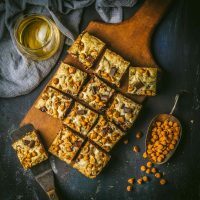 In 3 parts total, alternately add the dry ingredients and the buttermilk to the batter, beginning and ending with the dry. Mix until just combined. 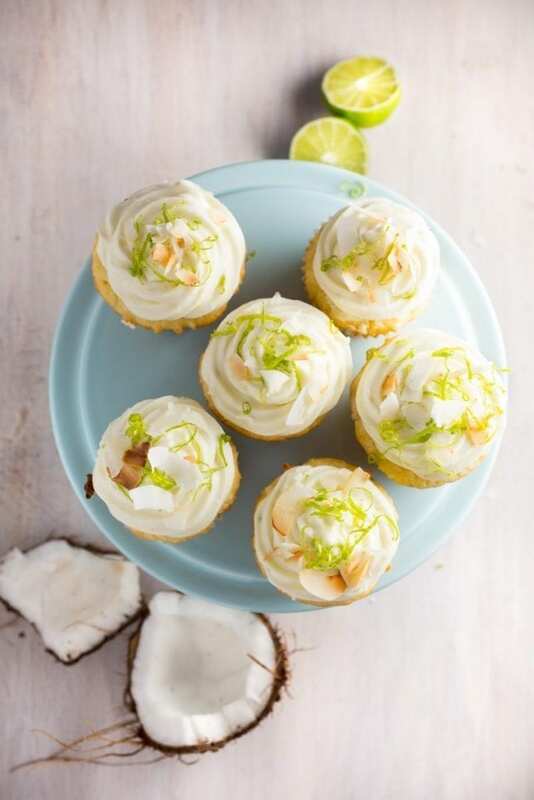 Using a spatula, fold the coconut into the cupcake batter. 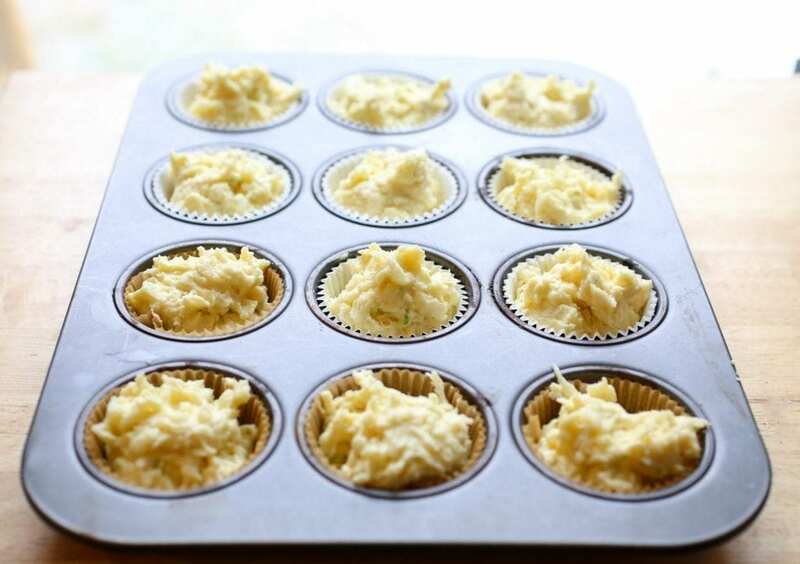 Line a muffin pan with paper liners and fill each liner almost to the top with batter. Using ¼ cup ice cream scoop or measuring cup is a great way to ensure cupcakes are all the same size. Bake for 20-25 minutes or until the tops just begin to color and a toothpick comes out clean. Remove cupcakes from oven and allow to cool in the pan for 10 minutes and then transfer cupcakes to a baking rack to cool completely. While the cupcakes are cooling you can make the frosting. In the bowl of an electric mixer fitted with the paddle attachment, cream butter, cream cheese, juice and zest until light and fluffy. Add 4 cups confectioners' sugar, one cup at a time; continue beating until light and fluffy. If icing is too runny, add additional confectioners' sugar 1 tablespoon at a time. 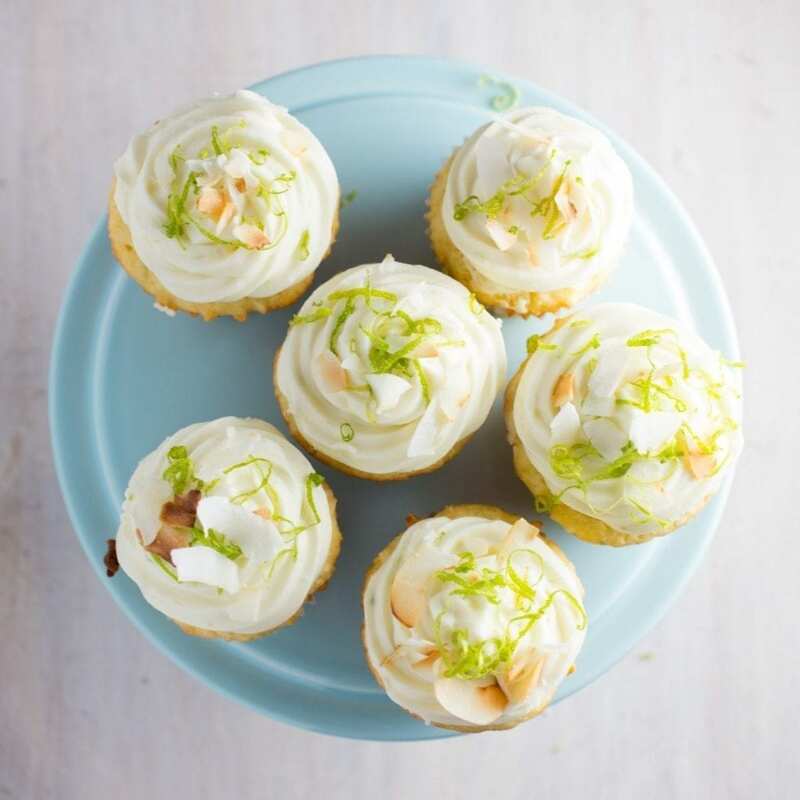 Frost the cupcakes and garnish with a bit of grated lime zest and toasted coconut flakes. 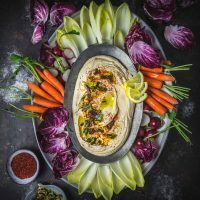 Key limes are fantastic if you can find them but if you can’t, just use regular Persian limes. What lovely looking cakes. You have got some great photos! Thanks so much! You have great ones too! Thank you! 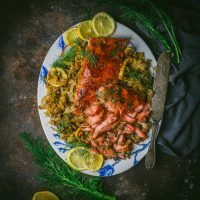 Yes, blogging is WORK but so much fun. I love that you gained weight on a bike trip. Awesome. the cupcakes look so good and your pics are beautiful!